Businesses with more than one owner often draw up a buy out plan should one of the owners pass away. In the event of an unexpected death the buy/sell plan ensures the stability of the company. Unfortunately, while most people plan for an unexpected death, many overlook the possibility of an injury or sickness permanently disabling one of the partners; even though a disability is much more likely! 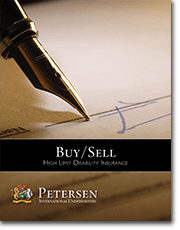 Buy-Sell Disability Insurance is invaluable in this type of situation; Petersen International Underwriters offers many high limit disability insurance plans designed to cover your clients and their buy/sell agreements. See our new Buy Sell White Paper. Mr. Boomer, age 59 who is involved in a buy-sell agreement. As a partner, he is obligated to buy out the business interest of another partner in the event of a permanent total disability. The firm has prospered and is now worth $4 million. His share of the buyout would be $1.33 million. When the company was new the buyout would have been a liability of only $100,000, but even so Disability Buy-Sell was purchased. It was increased over time and now provides a benefit of $400,000. This falls short of the purchase price by almost $1 million. Not a comfortable check to write! But wait, it gets worse. Next year the plan’s benefits start reducing by $80,000 (20%) per year over the subsequent 5 year period until it drops to zero and then it terminates. At a younger age, this far-off exposure created no personal alarm for he intended to retire at age 60 or 62. His attitude has changed and he plans to work to age 67 or 70, or maybe even 72. But the disability buy-sell continues down its eroding path. Such a matter is easily repaired by connecting with a Petersen International Underwriters policy that either supplements or replaces the old fashioned, lazy disability buy-sell plan. For a company, the sudden disability of a partner can be more detrimental than his or her death. In some cases the healthy partner is burdened by the disabled partner. The disabled owner, not able to productively contribute any longer (but now on sidelines with lots of time on his hands), constantly raises concerns about how the company is being managed and suggests changes. In this case the disabled is still earning a salary but not contributing positively to the company and it would be in the company’s best interest for the healthy partner or partners to buy out their disabled partner. Prescribing adequate amounts of Disability Buy-Sell Insurance is a perfect solution to this problem, and an effective way to save the company from financial distress.